Six Senses Zil Pasyon is located on the private island of Félicité, just 40 nautical miles from Seychelles International Airport. At Six Senses Zil Pasyon, guests are invited to embrace their spectacular surrounds while enjoying every creature comfort. The resort is the centerpiece of Félicité, a private island nestled just 30 nautical miles northeast of Seychelles International Airport. Here, massive granite rocks and dreamy white sand beaches help create an atmosphere of dramatic beauty. Just 30 pool villas are located on the island, each surrounded by lush vegetation and boasting private pools, air conditioning, mosquito netting and complimentary Wi-Fi Internet. The resort's Six Senses Spa blends a magical oceanfront location with a sophisticated slate of treatments. Guests can choose from an extensive menu of signature therapies across five treatment villas, an elevated saltwater pool and a yoga pavilion. Cuisine of the Seychelles draws influence from a myriad of sources, and this fact is reflected in the dining choice available at Zil Pasyon. The Island Cafe is an all-day dining establishment that offers a melting pot of European, Asian and African fare. At The Chef's Kitchen, guests are free to interact with gourmet chefs as they handcraft tailored, mouthwatering dishes. Finally, Ocean Kitchen delivers fresh catch from local fishermen embellished by the best in organic fruit and vegetables. 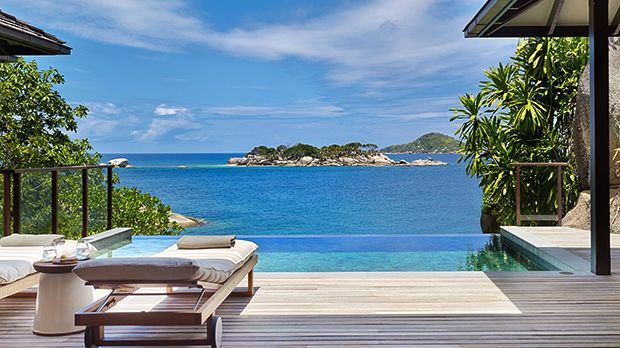 Send an availability request with your requested dates to the Six Senses Zil Pasyon, Seychelles. Features a king or twin beds, garden or ocean view, complimentary Wi-Fi Internet, flat screen TV, air conditioning, in-room safe. Features a king or twin beds, complimentary Wi-Fi Internet, private pool, flat screen TV, air conditioning, in-room safe. Features a king or twin bedding, complimentary Wi-Fi Internet, flat screen TV, air conditioning, in-room safe. Features a king or twin beds, complimentary Wi-Fi Internet, flat screen TV, air conditioning and in-room safe. Features two king or twin beds, garden and ocean view, complimentary Wi-Fi Internet, flat screen TV, air conditioning, in-room safe. Experience Félicité Island with style and space. The inspired design of this residence presents an ultra-sleek master bedroom on the upper level that features its own plunge pool. The transparaent base of the pool allows natural light to filter playfully through to the living area below. Vast floor-to-ceiling windows invite breathtaking panoramas, while the spacious master bathroom, finished with warm grey marble, features a double vanity and stand-alone soaking tub. The lower level offers a fully-equipped gourmet kitchen, two bedrooms with marble ensuite bathrooms and a spacious living room. The communal area has an impressively high ceiling with the pool above as its centerpiece, and the room opens to an external terrace with large infinity-edge pool. The residence takes full advantage of the wonderful vistas of the surrounding island and Indian Ocean. Honey-colored oak floors are featured throughout, with the deck taking on a soft grey weathered finish.